As the photographer John Thomson was captivated by China, its people and its landscapes, so Victorian collectors were fascinated by Chinese art and culture. Merton and Annie Russell-Cotes visited China in 1885 and bought many objects, including swords, carvings and ceramics which became the basis for the Russell-Cotes Chinese collection, and it has been augmented since by further collecting. On display are objects from China which span thousands of years, reflecting the cultural and aesthetic richness of a vast and diverse region. From bronzes used in burial rituals to porcelain vases meant solely for aesthetic contemplation, this collection helps tell stories about religious beliefs, political power and artistic traditions while inspiring us with their enduring beauty. Despite its diversity, the works seen here tend to share certain themes: a respect for cultural traditions, overlapping philosophical beliefs, common linguistic systems and an interest in the natural world. Imported ideas also had a significant influence. The Chinese exported silk, ceramics, and other materials along land and sea routes, known as the Silk Road. Both material goods and new ideas came back to China along these routes. For example, Buddhism arrived from India around the first century C.E., influencing well-established philosophies like Confucianism and Daoism and inspiring new religious art. Artistic styles from the Mediterranean and the Middle East also shaped Chinese architecture and ceramic ornamentation, with stylized floral patterns derived from Persian art and blue enamel developed from imported cobalt. Nonetheless, Chinese artists maintained their own rich artistic traditions, and by the 12th century they began to look back to Chinese history intentionally for inspiration. Scholars who were especially versed in history furnished their desks with traditional objects. 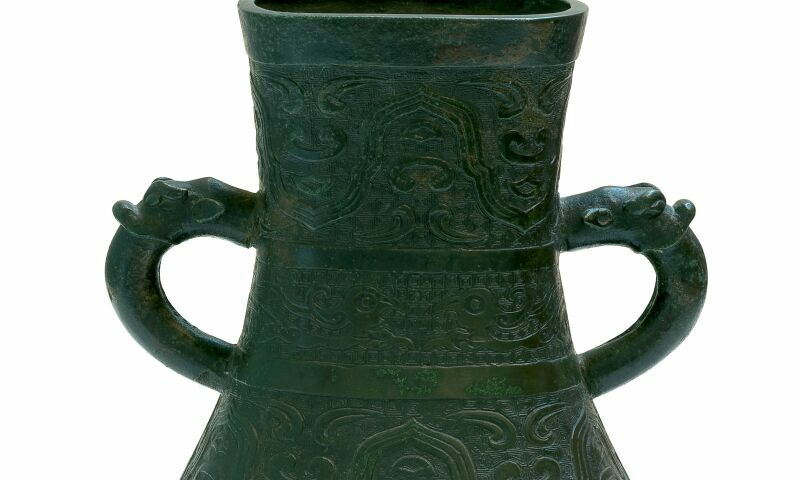 As seen within the motifs of many of these objects, even as modern designs were used, they still preserved ancient and distinctly Chinese forms.